"Sick To Death Of NEVER Making A Cent With Resell Rights Products?" It's true. How do I know, because that was me not too long ago. I would stock up on resell rights products as fast as they were released. I had tons that were collected from giveaway events, dime sales, firesales, resellers sites, membership sites and every place imaginable. I wanted to experience the same earnings other marketers were boasting so I scooped up every package available, everything from baking to articles to software even the collections of thousands of ebooks ready to make a fortune and then... nothing... not a damn thing! Where were the stacks of money marketers were boasting you could make from resell rights products? because I must have blinked and missed it, I wasn't seeing that at all. No matter how hard I tried, how many expensive PPC campaigns I placed, how many articles I wrote, how many email and ezine ads I paid for, I just couldn't make money with resell rights products. Why wouldn't they sell? it should have been a no brainer as far as I was concerned. To my surprise people avoided them like the plague. Why? I mean lots of others were selling them, surely they were raking in the piles of cash. All those people couldn't be wrong. The truth I found out later was that most people selling their resell rights products weren't seeing a penny either and it was because they were doing it all wrong and I was one of them. It was the other 10 of clever resellers that were hovering in the cash that we, the clueless other 90 was missing out on, and I wanted in. No matter how many failed attempts at selling my resell rights products I didn't want to give up. I knew that to turn my luck around I had to get a clue and figure out what I was doing wrong. Obviously it was something I was doing and my pathetic Paypal balance proved it. So no matter which rung of the ladder I'd climb onto I always seemed to be missing a step. I would end up in the middle of a resell rights process without ever knowing how I got to that point in the first place. I once had a math teacher who taught that every expert in any field must first master the basics before they can master that field and it's true. When you miss important steps it's difficult to move ahead because you need those foundations in order to progress. What I found is each ebook only had part of the puzzle, what I wanted was a complete picture from A to Z that wouldn't leave me guessing and wondering what to do next. Start here, then proceed to B all the way up to being profitable at Z.
I finally learned what I was doing wrong the whole time and why I wasn't making a penny. I know you're feeling as frustrated as I was, it's easy to when you don't know where to start, it's like drifting in the middle of the ocean without knowing which direction to go in. Not now you won't. I'm throwing you a compass and a map that will show you not only where to start but all the steps you need to be profiting wildly with resell rights products even if you never made money before. Imagine just for a second what it would be like if all of your efforts really produced the results you've been struggling for? Let me tell you it isn't and this ebook is going to prove it. Everything I'm about to share with you has been tried in real life and really works, period, how do I know? because I've used it over and over again and it keeps producing similar results each time. Discover how to leave your competition in the dust just by doing what they won't bother to. Their loss is your gain. Failure to get this right from the start will leave you with a losing horse no matter how much money you shell out to promote it. You won't make that mistake. Discover how to double your writing speed in one easy step you'll be churning out as many money making resell rights products as you want in a fraction of the time. Feel what it's like to be in the 10 of successful resellers that are silently raking in the cash from the other 90 who have no clue. 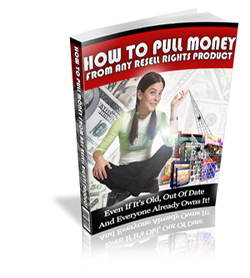 If you want to avoid the pitfalls I fell into when I first started and begin to see how incredibly profitable resell rights products can be for you even if you've never made a cent before then this is for you. All you need to have is the desire to succeed and the action to follow it through, that's all.